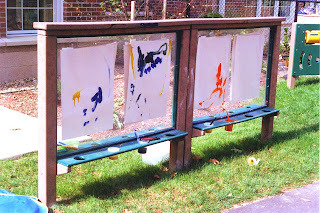 Home : Blog : Fine Arts : What can be done better outdoors than indoors? What can be done better outdoors than indoors? For today’s blog, I am going to focus on messy things and why it is so much better to do them outdoors. I think of a preschool art easel and how much work teachers go to indoors, taping newspaper on the walls and the floors to make sure if children splatter paint or spill things, they can easily clean up the space. Outdoors, if we are using a biodegradable paint, there is no need for this. We can simply let the paint hit the grass and biodegrade. Also, when it comes to clean up with an outdoor art easel, you just take your water hose and squirt it down. 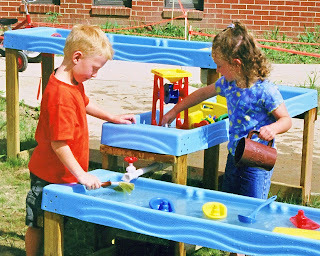 Sensory tables frequently have messy items put in them that require clean up after use. Many times the items we put in a sensory table are biodegradable, such as bird seed, cornmeal, oats, etc. 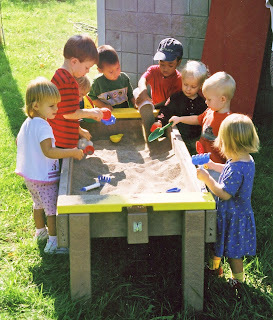 Take messy sensory table activities outdoors, so when children spill things the local birds and creatures will clean up after them. This brings wildlife to your playground, which is another important asset to an outdoor classroom. If you have ideas or questions on things that can be done better outdoors, please comment or contact me.